Usually I write my own reviews of poker related products, but the people behind the MagicHoldem online poker odds calculator were kind enough to put together a well written and more or less objective review of their product, which I have chosen to post here. If you like the review below and want to support the Poker Bankroll Blog I would really appreciate it if you sign up through my affiliation link above. Online poker is a challenging game, but it need not be so hard to learn with the help of an online poker odds calculator. This review takes one of the more popular calculators, MagicHoldem, out for a test drive to see if it’s good. Read the review to see if the benefits are worth the money. Pay $89.90 per year, or 119,9$ for a two year license. Register and make a small deposit (from 20$-30$) with one of the 4 different poker room affiliates available through the MagicHoldem website. To go the license route is expensive, but even casual players will find that they can recoup that cost pretty quickly with the extra wins. Thankfully, you don’t have to go into this purchase uninformed. The developers of MagicHoldem allow the software to be demoed for 100 hands. If this still isn’t enough to convince you, their support team can give you an additional 200 hands. What is it all about? Well, professional online poker players know that the key to playing poker is knowing the odds. Bluffing is a necessary talent, sure, but mastering the art of bluffing won’t guarantee that you win games. Consistent winners in poker know about playing the odds to their advantage. Strong players knew concepts like pot odds, where even with a weak hand, the recommendation is to bet as the pot is so large relative to the cost to try for it. The advantage with playing online poker is that you can have calculators that do this for you and provide this information in real-time. MagicHoldem is one such tool and for the most part, does a very good job of displaying all the vital information needed during a game. Installing MagicHoldem is straightforward. Download the odds calculator, let it install, and then run it. Once installed, MagicHoldem automatically detects your online poker room as long as it’s one of the 100+ supported. For the most part this detection works like a charm, although there are times when resizing the window or doing other stuff can cause some problems, but for the most part, such occurrences are very rare. Contacting support is easy and so far, their replies have been both quick and knowledgeable. However, ease of installation and hand detection are completely useless if the data displayed isn’t worth anything. Fortunately, MagicHoldem includes virtually every necessary statistic to help any player make an informed decision. In a single glance to the left side of the table, at any time of the game, you can determine all important probabilities. For example, in the screen shot provided, before the rookie all-in decision was made that there was a 44.7% of making a pair. With the 0.1% probability under the straight flush column, there was also the confirmation that it was possible to not only make the flush, but that the cards were close enough for a straight flush to also be possible. Below those stats are the pot odds calculations and the potential outs. One benefit to MagicHoldem over other odds calculators is that it graphically displays the outs which makes it easier to visualize the possibilities. It also helps confirm that the calculations are being made correctly. All in all, the MagicHoldem online poker odds calculator provides any poker player with a wealth of information. It’s unobtrusive and blends in nicely with virtually any table. 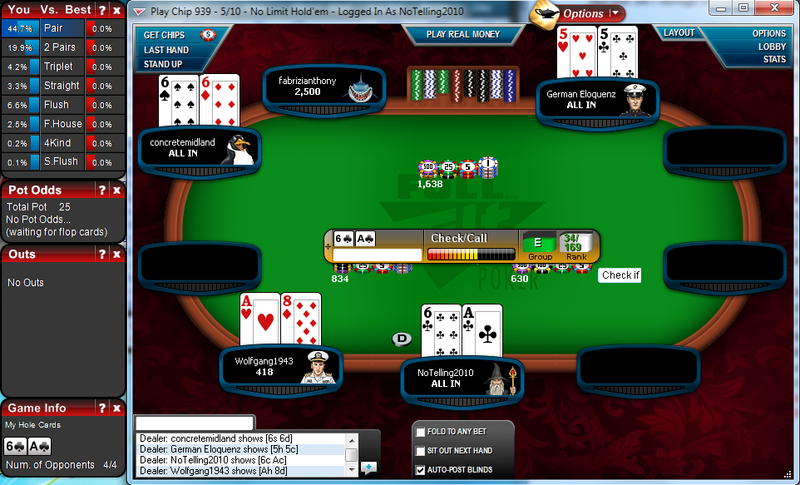 In the screen shot, the player made a newbie decision – they went all in with a hand that looks strong, but isn’t really. Here, MagicHoldem’s advice to wait and be cautiously optimistic was sensible. There are a lot of potential winning combinations with A-6 suited, but none of them are particularly likely to appear. That’s not to say that MagicHoldem’s advice is to be relied upon exclusively. Behaving in such a robotic manner is very easy to see through in the long run. However, it does make a good guide and allows the player to develop a good intrinsic sense of the cards and situation (for example, when to bet due to pot odds). Combined with solid poker strategy reading and a lot of practice, MagicHoldem definitely does make a good companion and will help most players develop winning instincts.